This is very interesting Brain Teaser Puzzle for Kids. In this Puzzle Picture, there are relative ages of three persons given and your challenge is to calculate their individual ages. So can you solve this Simple Maths Age Puzzle? Can you solve this Brain Teaser Puzzle? 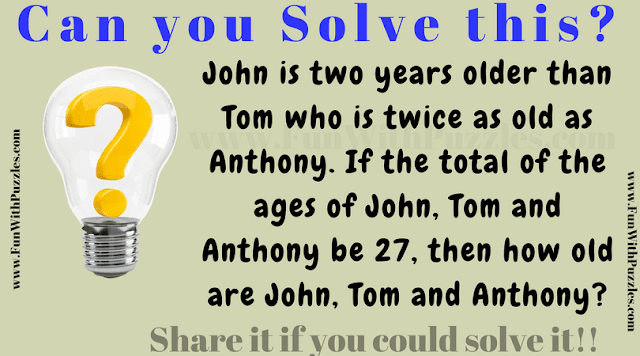 Answer of this "Brain Teasers Puzzle for Kids", can be viewed by clicking on button. Please do give your best try before looking at the answer. Lets Age of John, Anthony and Tom be represented with J, A and T respectively. We are given following equation to solve.